A team of astronomers, led by PhD researcher Malcolm Druett of Northumbria University at Newcastle, have taken a big step forward in understanding a 30-year-old mystery in the process of formation of solar flares. Druett presented their work on Monday 3 July at the National Astronomy Meeting in Hull, and the research appears in a paper in Nature Communications on the same day. The team looked at solar flares, large explosions on the surface of the Sun, which can be associated with the eruption of large amounts of matter, sometimes headed towards the Earth. These coronal mass ejections can cause adverse ‘space weather’, disrupting communications and even electrical power supplies. 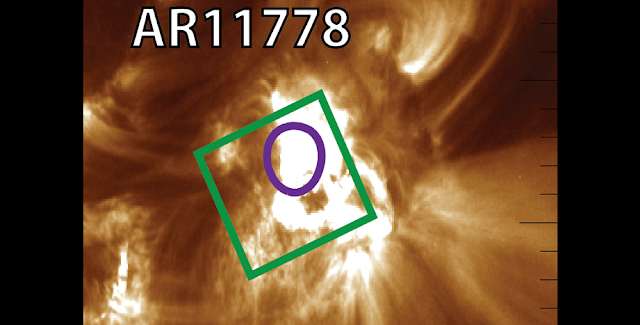 The H-alpha emission associated with solar flares when observed from the ground is seen to be strongly redshifted, implying a high speed of 50-55 km/s for the flare material. In contrast, when observed by space probes such as the Solar Dynamics Observatory, the emission is seen blue-shifted with velocities up to 100 km/s.